In this episode Phil Walter joins me to discuss some of the concepts laid out in his recent post on Blogs of War about ungoverned spaces and how they’re viewed from a national security perspective. 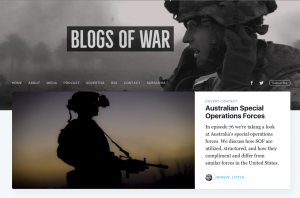 His recent piece on Blogs of War challenges some of the lazy assumptions and imprecise thinking on the topic and we dig a little deeper, and explore the possible implications of it all, in this episode. This was a particularly enlightening conversation for me because Francesca pushed back hard (appropriately I think) against my tendency to view work like hers in the context of international aid or counter-extremism efforts. There may be a place for art sponsored to support social or political agendas but Francesca’s work comes from a different place. She makes a very strong case for putting the art, and the artists, first. Afghanistan has a rich cultural heritage spanning thousands of years and talented artists working today. We should be able to appreciate the work without forcing it into the context of the current conflict.